Being fast on the ball is an important skill in soccer. Being fast off the ball is even more important. Individual possession of the ball consists of less than 2% of the game. Obviously, that leaves an athlete to play ~98% of the game without the ball. Sprint skills are becoming more important in soccer  and professional players have become faster. Seeing as straight sprinting is the most frequent action prior to goals, both in scoring and assisting, an athlete should be able to effectively accelerate and progress to proper upright sprinting mechanics. 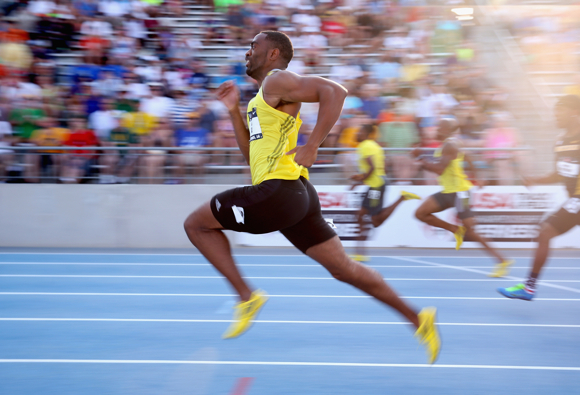 There is much more to maximal velocity sprinting than being presented here, but these ideas are typically the cause of many other minute flaws that athletes and coaches alike, try to fix first. When walking down the street, you can clearly spot the alpha-males – spine is upright, chest out, shoulders back, and head and eyes straight ahead. This should be no different while sprinting… yet it is. You don’t want to see a guy running around like a bobble-head doll, hunched over with their shoulders rounded, hyper-lordodic, or with arms flailing around. You would like to see neutrality from the ankle to the head. The ability to stabilize your body while in flight or in single-support is extremely important to maintain limb stiffness (which can equate to more force into the ground) and to ultimately preserve speed. Knees up can help promote frontside mechanics (any action that occurs in the front of the body). While directly promoting frontside mechanics, you are indirectly limiting backside mechanics (any action that occurs in the back). Limiting backside mechanics can help minimize breaking forces that are detrimental to maintaining speed. This movement of lifting the knees up, or flexion of the hip, can also aid in producing more force into the ground. Mike explains this concept as a hammer nailing a nail flush into a piece of wood. If you take a short, choppy strike at the nail, the nail won’t be driven far into the wood because there is no room to accelerate the hammer toward the nail. Conversely, if you take a huge swing at the nail you could put the nail into the wood in one or two strikes because there is more room to accelerate the hammer. This same concept can be applied to knee height in sprinting. If your knee stays low, like a short, choppy hammer strike, there is minimal ground reaction force. A high knee has greater potential to increase ground contact force, thus increasing stride length and vertical propulsion. Dorsiflexion of the foot (think toes up) places a greater pre-stretch on the achilles, gastroc, soleus, etc. Because this complex is under an active pre-stretch, they are capable of producing a greater concentric contraction due to the stretch shortening cycle – like a rubber-band that is fully cocked. Loren Seagrave’s credit card rule (or at least I heard it from him first) can be a nice cue to maintain slight dorsiflexion until toe-off. As the the foot touches down directly under the hip, you should be able to slide a credit card under the heel. This can be a great visual representation of where the athlete’s limb and foot should be in relation to the ground. The reason for this is so the athlete does not get in the habit of toe-running and so there is no unwanted breaking forces that comes with heel-ground contact. 1. Carling C. Analysis of physical activity profiles when running with the ball in a professional soccer team. J Sports Sci. 2010 Feb;28(3):319-26. 2. Faude O, Koch T, Meyer T. Straight sprinting is the most frequent action in goal situations in professional football. J Sports Sci. 2012;30(7):625-31. 3. Haugen T, Tønnessen E, Hisdal J, Seiler S. The Role and Development of Sprinting Speed in Soccer. Int J Sports Physiol Perform. 2013 Aug 27. 4. Haugen TA, Tønnessen E, Seiler S. Anaerobic performance testing of professional soccer players 1995-2010.Int J Sports Physiol Perform. 2013 Mar;8(2):148-56. I 100% agree with the mechanics to optimise speed in general (i.e. straight line sprints) but I don’t think this type of technique (most notably high knee lift) is conducive to successful movement for football. High frequency of ground contact is imperative for effective direction changes. A player needs to adapt motion to constant internal and external cues…I would not agree that players could do this effectively with a ‘knees up’ strategy. Thanks for the comment. We agree that for changes in direction and on-the-ball running that higher frequency is beneficial. But for game-breaking down field speed, players should also be able to change gait patterns and run in the most mechanically efficient and fastest way possible. The overwhelming majority of the game is played without the ball so for all running mechanics to be based around optimizing what you do only when you are with the ball is not something we recommend. Very much agree that players spend relatively small percentages of the game in possession of the ball, but I didn’t mention this in my earlier post. I just refer to running mechanics in general for football players. The distances that these players sprint in one single bout is quite short, so very rarely would you see a player progress past an acceleration phase without changing direction or enhancing in some other game activity. Based on that I personally wouldn’t recommend high shoulders, straight back and high knees for footballers.